The survey’s results are not surprising. They show a continued and even growing trend toward “Israelization” among many east Jerusalem Arabs as a consequence of living in a unified city for the past 50 years. The image of a divided city is apparently fading away and disappearing from the memory of those still living there today. The survey shows that a considerable number of east Jerusalem residents are prepared to put this “higher purpose” to one side. They are ready to disconnect and differentiate between the local, municipal arena and Palestinian national goals, which don’t appear to be attainable at this time. An increasing number of citizens in east Jerusalem now believe that the way to receive city funding – which for many years has mostly been allocated to the western half of the city – is through having a political influence upon the city council. A completely separate question is whether this trend, which has grown stronger over the years, will translate on Election Day into voting en masse by the Arabs of east Jerusalem at the polls. The answer is: not necessarily. The Palestinian Authority and Hamas have already announced that they are opposed to participation in municipal elections. Past experience has shown that this doesn’t only refer to verbal opposition. On previous occasions, the Arab population that sought to participate in local elections, as well as public figures among the Arabs of east Jerusalem wanting to run for office in the city council, were threatened. Some of them were even physically harmed as a result of violence and terror carried out by Hamas or Fatah operatives. For example, when Hanna Siniora, former editor-in-chief of al-Fajr, wanted to run for the city council, two of his cars were set on fire. Local initiatives organized in Beit Safafa and Sur Baher suffered the same fate. During earlier elections, at least once (in 1969), terror organizations managed to torpedo any significant participation by east Jerusalem Arabs and the running of Arab lists in municipal polls. Only a low percentage of those with the right to vote in the eastern part of the city went to the polls. Terror won out. The small voter turnout expressed a Palestinian nationalist message regarding formal recognition of the Israeli government and actual unification of the city. Israel, from its point of view, did not succeed or manage to create a sense of security that allowed many residents of east Jerusalem wishing to vote to participate in the elections. The threat was far too tangible. This time, there are also some figures who want to run in the elections to the city council. The electoral potential of over 300,000 Arabs in east Jerusalem, currently forming around 40 percent of the city’s population, is extremely high: at least one-third of the members of the city council. 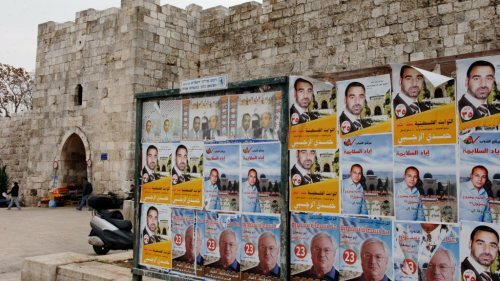 Due to the status of permanent residents that they received immediately after the Six-Day War, east Jerusalem’s Arabs are entitled to vote in city council elections (though not in Knesset elections). However, after so many years of boycotting, the likelihood of this potential being fully or significantly realized at any significant level is still very low. On the other hand, the possibility that several thousand or even tens of thousands of east Jerusalem Arabs may participate in the elections is much higher, even if it is not certain. Everything depends on the levels of threats and the protection that Israel will provide to those seeking to vote or run in the elections. Nine months before the upcoming Jerusalem city council elections, there are already two initial candidates, though it is not clear whether they will manage to overcome the threats of Palestinian violence and terror. One of these is Dr. Ramadan Dabash, leader of the Sur Baher community council, who has announced his intention to run for the municipality. The second is Iyad Bibuch, a teacher from Shuafat, who is trying to form an east Jerusalem political party. The common factor between both of these candidates, similar to previous initiatives that foundered before their time, is their aspiration to bypass the political conflict regarding the city’s future in order to concentrate on municipal activity and a concern for the welfare of the residents of east Jerusalem, which has been seriously neglected. The candidates’ basic assumptions and those of their observers may be a little different this time. Following the elections, the representation of the residents of east Jerusalem on the city council will depend upon two main factors: necessity and reality. Much has been written about necessity. There are vast gaps in the levels of services and infrastructure between the Jewish and Arab neighborhoods of Jerusalem within almost every parameter: roads, sidewalks, the sewage system, water, education, and more. In recent years, there have been attempts to redress the mistakes of the past and to allocate more funding to east Jerusalem. However, the discrepancies are still very large, and it will take a long time to change the situation there significantly. This is the case regarding necessity. In terms of reality, though, it has led to the Israelization of many Arabs in east Jerusalem. Even without the elections, Israelization is the upshot of living together in a united city, alongside a Jewish population, for the past 50 years. A decisive majority of Jerusalem’s population, Jewish as well as Arab, don’t remember a divided city. Around 85 percent of Jerusalem’s Arabs and 75 percent of the city’s Jews were born within the reality of a unified city. For them, the days when it was divided are a chapter of distant history. They grew up in a single city without any divisions or borders. This detail has been translated into the fabric of a normal coexistence that is a blend of different lifestyles. While there is a national and religious struggle, Jerusalem’s residents still live side by side. Shared aspects of life include Jewish and Arab doctors and nurses, working together to serve both populations in the city’s hospitals and also at the branches of the various health funds. There is also a shared pharmaceutical system. Arab and Jewish drivers both work within the Egged cooperative and drive the city’s taxis and private buses. Of course, there is also a joint community of passengers. Jews and Arabs mix at Jerusalem’s various leisure spots, including restaurants, cafes, and shopping malls. In all of these places, there is a large pool of Jewish and Arab consumers, as well as Jewish and Arab employees. Parts of the city are also connected through joint infrastructures. Services are provided to all areas of the city, including water, sewage, electricity, and telephones, as well as a shared system of arterial and secondary roads, crossing Jerusalem both lengthwise and widthwise. Despite all the tensions, the national-religious conflict, and terror, Jews visit all of the four quarters of the Old City, where they shop and walk around. Arabs visit the western parts of the city, mostly for work, leisure, and shopping. The boundaries between neighborhoods are simultaneously a site of tension and conflict and a meeting place for commercial activity, tourism, and shared necessities created by mutual interests. The most outstanding expression of this coexistence is the light railway, which serves hundreds of thousands of Jews and tens of thousands of Arabs. It defies the ongoing attempts of the enemies of normalization, the terror organizations, to harm it. The train passes through Jewish neighborhoods and also the Arab neighborhoods of Shuafat and Beit Hanina. Additional light railway lines planned for the future will also pass through both Jewish and Arab residential areas. Another aspect of “Israelization” relates to the fields of education and university studies. An increasing number of young Arabs want to study at Israeli academic institutions. To achieve this, they need to pass Israeli bagrut [matriculation] exams. Learning centers in east Jerusalem prepare these young people for Israeli bagrut exams. A growing number of families in east Jerusalem are currently choosing to send their children to study at schools where they follow the Israeli curriculum. This number of children has reached 5,500, as compared to less than 1,000 only a few years ago. The proportion of students following the Israeli curriculum among the total of students in east Jerusalem may still be very small, but this is a gradual rise, symptomatic of an increasing trend. These kinds of ‘blending’ are naturally created by a shared economy and a level of codependence. Within various industrial sectors, the comparative proportion of employees from the eastern part of the city forms the main workforce with regard to size and importance to the city’s economy. Workers from the eastern part of the city are 66 percent of employees in construction, 52 percent of those employed in transportation, 38 percent of those working in the hotel and food industry, 32 percent of workers in the industrial sector, and 21 percent of those employed in health and welfare. The livelihood of the residents of east Jerusalem depends on their employers from the west, and the business of west Jerusalem’s employers depends on their workers from the east. The different identity of the Arabs of east Jerusalem, which sets them apart from the residents of the West Bank, is affected by all of the above. This identity is also affected by their permanent resident status and the establishment of the security fence. The fence, which was erected 15 years ago, has compelled Palestinian residents of east Jerusalem (apart from the northern neighborhoods that have remained outside its border) to change direction and turn west. It has also contributed to the strengthening of this blending process and the fabric of normalization. Other researchers have also seen evidence of blending and normalization. Seven years ago, the Washington Institute for Near East Policy conducted an in-depth survey among the Arabs of east Jerusalem. It found that 35 percent preferred to live as citizens with equal rights under Israeli sovereignty in Jerusalem. Three years ago, in June 2015, an additional survey by the Washington Institute revealed that this number had increased. On the date when the latest survey was taken in the neighborhoods of east Jerusalem, the proportion of residents who stated outright that they preferred to live as Israeli citizens with equal rights under Israeli sovereignty had reached 52 percent. Coexistence in Jerusalem has therefore defied political formulas more than once. This is not a love story, but a story of shared interests and recognizing reality, public benefit, profitability, economics, and earning a living. In the existing Jerusalem reality, coexistence has not turned the Arabs of east Jerusalem into friends. It does not negate terror or hostility, but it exists alongside them. To what extent will it lead the Arabs of east Jerusalem to the polls in October? This question still remains open. What is clear is that the desire for this to happen exists. Whether the conditions for this to occur will be created still remains to be seen.